Nin Jiom Pei Pa Koa is a Chinese natural herb medicine ( TCM ) against lung disorders including, cough, hoarseness, loss of voice, dry skin, sore throat and colds. How many of us are swept away by what I have come to call an “active laziness”? Naturally there are different species of laziness: Eastern and Western. The Eastern style consists of hanging out all day in the sun, doing nothing, avoiding any kind of work or useful activity, drinking cups of tea and gossiping with friends. Western laziness is quite different. It consists of cramming our lives with compulsive activity, so that there is no time left to confront the real issues. If we look into our lives, we will see clearly how many unimportant tasks, so-called “responsibilities” accumulate to fill them up. One master compares them to “housekeeping in a dream.” We tell ourselves we want to spend time on the important things of life, but there never is any time. Helpless, we watch our days fill up with telephone calls and petty projects, with so many responsibilities – or should we call them “irresponsibilities”? Thank you for sending me this heart felt email. You convey your emotions so beautiful and strong. I think and feel like this. I try to welcome and accept al my emotions – maybe you could do this too? I know its hard. I for sure do not want to be taking capture by the emotions of despair, anger and hate. When times are hard and I fall into the trap of emotional struggle or break up, I try to treasure the loving moments we have spend together. I try to forgive my self for my errors and mixed emotions and I try to forgive her with the sincerity of my heart. I know in my heart that I cannot change the past, so I try to accept the past and let it go. Its like I cannot hold on to any single breath of mine. The loving moments of my childhood belongs to the past. It is a time I cannot regain. I try to be thankful for what I have. I try to fill my heart with love. I try to be thankful for every moment I have in this life. I try to let go.. Everything changes ceaselessly just like the weather. And you know what? The weather is just the way it should be – and so are you! I almost forgot about this wonderful image from my black belt graduation in Daitoryu Aikijujutsu this spring. Sensei Seigo Okamoto from Tokyo, Japan visits us twice a year in Roppokai Copenhagen – Sensei has done that in a period of over 20 years. 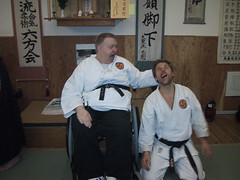 Ole and I have spent many wonderful hours in and out of the dojo here in Copenhagen. I look forward to every single training session! This is a tribute to Ole my local hero in Cph.